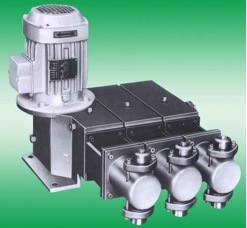 Developed from the design of NSP metering pump, DMP is a compact plunger metering pump, robust, monoblock construction that allows a modular system the assembly up to 6 pumping heads. 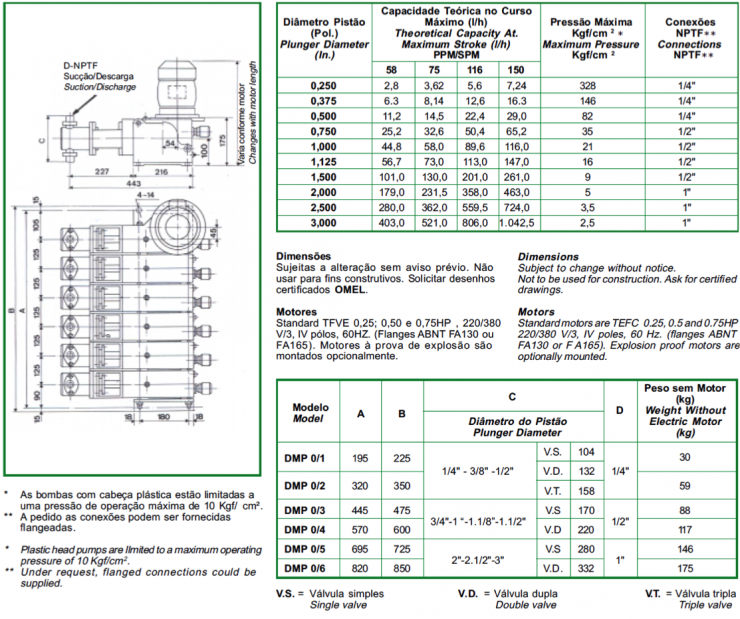 The pump operates with oil bath lubrication and each unit allows adjusting the pumps capacity while operating. Each unit incorporates (i) its own cam; (ii) adjustment system that allows the application of pneumatic, electric or electropneumatic adjustment capacity devices; and (iii) steam or water heated cooled pumping heads. Standard version (with head, valves, balls and plunger) in AISI 304 (CF8), AISI 316 (CF8M), AISI 316L (CF3M), AISI 304L (CF3), Alloy 20 (CN7M), Hastelloy B (N12M), e Hastelloy C (CW12M), depending on operating conditions. Plungers may be supplied in porcelain (96% aluminum oxide ALP3). Fully plastic pumping heads in PVC, high density poliethylene, polypropylene, PTFE, fiber reinforced epoxy or polyester resins, allied at the application of porcelain pistons and porcelain or sapphire balls.